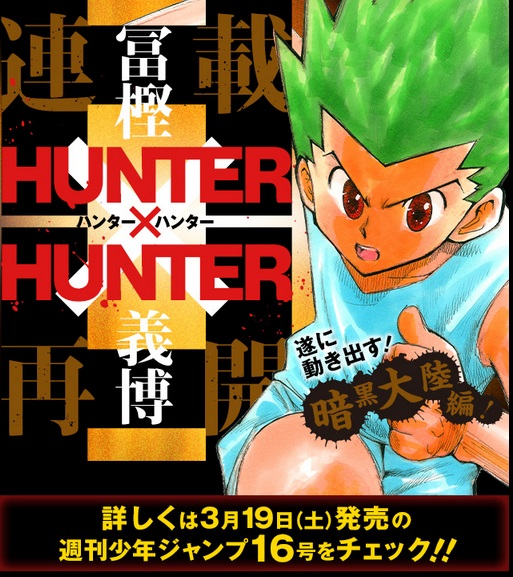 It was revealed by 7net, a Japanese online retailer, that the 34th volume of Hunter x Hunter is slated to be released on June 26. With this announcement, fans of the well-loved series will more reason to be hyped and looking forward to the upcoming new chapters. Hunter x Hunter fans were left hanging when the well-loved manga series went on hiatus for two years since 2014. The long wait was over when the series finally returned in the Weekly Shonen Jump since April 2016 and fans couldn’t be happier. Hunter x Hunter is a manga series created by Yoshihiro Togashi and was first launched in the Weekly Shonen Jump in 1998. Just a year after launching the manga series, Togashi married Naoko Takeuchi, the author of the well-known and internationally acclaimed mahou shoujo series Sailor Moon. To give you a synopsis of the Hunter x Hunter series, it is centered on a boy named Gon Freecss who is on a quest to find his father after he discovered that he wasn’t dead and still living as a Hunter, a licensed job dealing with hunting down criminals, and finding rare and unknown animals, treasure hunting and so on. The manga series follows Gon’s adventures in passing the Hunter Examination and meeting new friends while dealing with things related to the paranormal. The manga series was well-received in Japan that it paved way to have its own anime adaptation aired just a year later. It was directed by Kazuhiro Furushashi and produced by Nippon Animation. The anime series originally aired in 1999 until 2001 which was then followed with three OVAs (Original Video Animations) from 2002 to 2004. Another anime series was also produced and aired from 2011 and 2014. The franchise then branched out with two movies, video games, drama CDs, stage plays, musicals, and so on. As of 2014, Hunter x Hunter sold out a total of 66 million copies (in Japan) and is considered as one of Shueisha’s best-selling manga series. As of now, the Hunter x Hunter fan base continues to grow as the manga series finally continues after an indefinite hiatus and more media is expected to be released in the future. More information can be found in Anime News Network.